Although often taken for granted, the importance of the medical cart cannot be understated. They are used in hospitals, clinics, and nursing homes to move and store medications, equipment, and medical records for various medical situations that occur with bedridden patients. There are a variety of carts available with features and accessories to meet the diverse requirements that come up in just about any medical workplace. Crash carts are sometimes referred to as code carts because of their use during emergency situations. Emergencies require prompt action, and the crash cart is essential for moving medical equipment, supplies, and medication to emergency sites expediently. The carts are organized so materials can be found easily to perform procedures during a critical moment. There are different sizes and structures for crash carts depending on the medical facility and department that utilizes it. Most are usually between the height of a person’s waist and chest. They have many compartments and drawers. In most cases, medications are stored in the first drawer, supplies for intubation are in the second level, intravenous lines are placed in the third drawer, and sterile kits are found in the bottom section. Anesthesiologists rely on this useful tool to stay organized and to keep their tools ready for administration of anesthesia. Several drawers have a lock option to keep dangerous medication safely tucked away until they are ready for proper use. There are expandable table tops on the carts so tools can be laid out without overlap. Special wheels allow the medical professional to maneuver the cart easily. The metal on these particular carts is usually made to withstand long-term corroding effects of disinfectant. These particular carts are made for the bulk supply of IV bags and can be customized to fit any health-care facility’s needs. You can find different types of IV carts. Some have slanted, high-quality metal baskets set out in rows. This allows for insertion of IV bags to the back of the cart and quick removal of bags from the front. IV carts are made to hold the heavy supplies they typically carry. Other IV carts appear physically similar to other medical carts with a metal frame and drawer system. Used for bedside care, these carts are made of a high-quality metal that can withstand constant cleaning. They are light-weight, with swivel wheels, so they are easily maneuvered to and from the bedside. They are designed to hold supplies that a nurse or other healthcare provider may need while at a patient’s bedside. Some bedside carts contain drawers, and some have a locking capability. This type of cart also may have a removable workstation top. This allows the cart to be utilized by the medical professional while they are in the room and the patient once they leave the room. Also equipped with usually two or three lock-capable drawers, the treatment cart can be customized to fit the needs of larger hospitals, small practices, or school nursing stations. They have a large opening in the bottom area of the cart. For a cart that travels more often to multiple destinations, the opening may be replaced with doors that can lock. The carts are used to provide treatments, medications, and restock of saline for patients. Within the drawers, you may find tubs with dividers that help organize a variety of patient treatments. The carts may also have safe storage options for hazardous waste items. Point of Care (POC) workers are usually those that administer a medical test to the patient. They are equipped with a point of care cart that includes a mounted monitor, pull-out keyboard, portable battery technology, and storage drawers with a locking capability. Also found in the cart is storage for scanners, a mouse, and extra storage bins. The carts are important for logging information and traveling with their care worker. They are lightweight with swivel wheels for ultimate maneuverability. 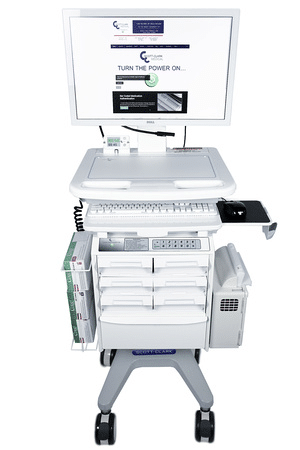 The height of the monitor can be adjusted for its facilitator and is portable for multi-patient use. The POC cart is an important asset for diagnostic testing in patients. It is usually made with a durable, plastic surface that is easy to clean. Medication carts may have more drawers and safety features than other carts. They were created for quick but accurate delivery of medication to patients. Each drawer has unit dosing boxes and electronic locking systems. Some carts have mounted monitors that allow for the proper logging of drug dispensing. The medication carts are adjustable for the care facilitator so they can sit or stand while using the monitor. There is a keyboard that can be tucked away when it is no longer in use. Storage baskets, mouse holders, and long-lasting batteries are also essential features of the medication cart.